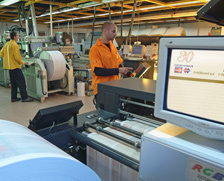 For the past three decades, Be'eri Printers has been the leader in printing and mailing services for businesses in Israel. This period was characterized by breakthrough technological innovations including the indentation of the Ma'atafit in 1984 and in 2000 – the development of the VariColor, a full color digital printer. These pioneering developments made Be'eri Printers a leader on an international scale. Developing the revolutionary VariColor digital printer, together with Scitex Digital Printing, has been recognized as a milestone in the print industry. This printer, the only one of its kind in the world at the time, prints at a rate of 1,000 color pages per minute, 20 times faster (!) than the other digital printers existing then. Over the years, Be'eri Printers pioneering innovation in digital printing became the worldwide standard for business printing and mailing. It enabled printing large quantities of bills and statements in full color, combined with personal messages, coupons, marketing banners, or segmented inserts based on the end users buying habits. The digital revolution was accompanied by a variety of advanced solutions for smart enveloping of bills and statements, supported by unique Matching, Grouping and Selecting capabilities.